Enjoy this roast fish and salad with a rich, savory tomato miso sauce. The entire meal can be prepped and finished within 30 minutes. It is fresh, bursting with flavor, and full of nutrition. I have been exploring new ways to enjoy fish since getting this wonderful package of fish from Sizzlefish. Tomato miso sauce is something I recently discovered in a Taiwanese cookbook (Fish Encyclopedia) and I have enjoyed it tremendously. 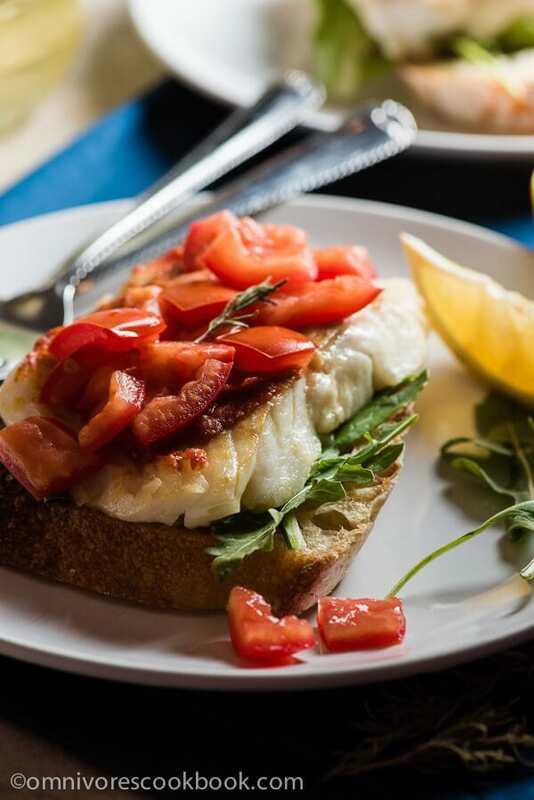 If you follow the recipe below, you will get a flaky and tender fish with a slightly charred surface, crispy skin, and juicy topping. The sauce is well balanced and brings out the great flavor of the fish without overpowering it. 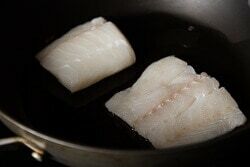 I used it to cook some wild-caught sablefish and cod fillets. They both turned out wonderfully. I could even taste a bit of sweetness in the cod. 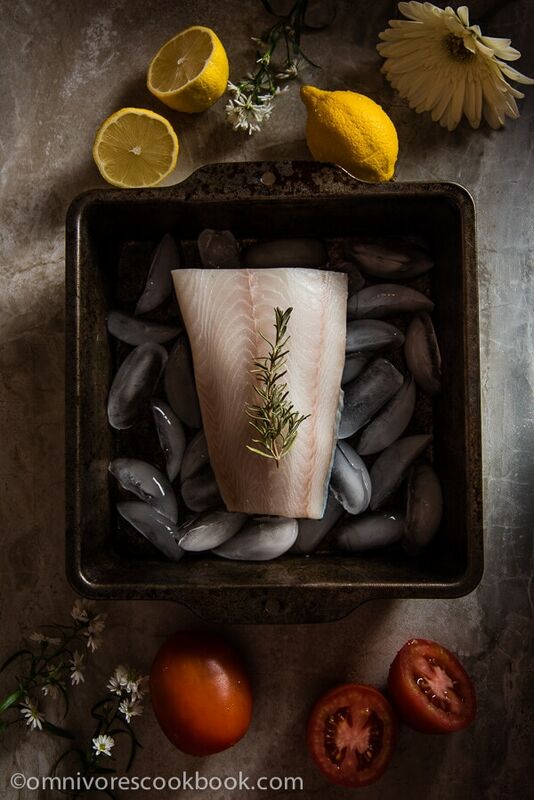 My favorite part of the recipe is that it lets me enjoy a fillet with crispy skin and a well-seasoned body. 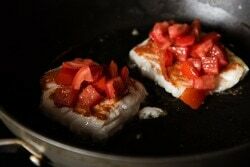 By cooking the fish on the stove top, you can get the surface crispy and charred. Then, you continue to cook it a bit more in the oven, so you can get the fillet a bit juicier, with a well-cooked sauce. The sauce tastes great raw and cooked. Making the sauce is really simple. All you need is equal parts red miso, tomato paste, lemon juice, and diced fresh tomato. That’s it. The savory sauce has a hint of sweet and sour. The miso gives it a rich umami and depth of flavor that made me think of cheese when enjoying the dish. 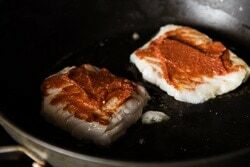 We used a third of the sauce to season the fish, then blended the remaining sauce with some olive oil and water, and BAM! We had a great bread dip and salad dressing in 5 seconds! We tried the sauce with a large green salad, some ciabatta, and of course, with the freshly roasted fish. You see, we finished prepping and cooking this really nourishing and delicious meal in 30 minutes! Preheat oven to 356 degrees F (180 C). 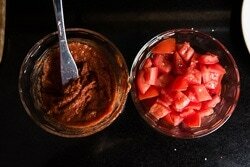 Combine red miso, tomato paste, and lemon juice in a small bowl. Mix well. Remove seeds from roma tomatoes and dice them (*see footnote 2). Dry fish fillets thoroughly with paper towels. Lightly season fish with salt. Heat oil in a large oven-safe skillet over medium heat until warm. (Optional) Add rosemary and cook for 1 minute to infuse the oil with a nice aroma. Add fish fillet, skin side down. Cook for 2 minutes, until the skin turns crispy (or the flesh turns pale golden). Flip and cook the other side for a minute, until slightly golden. 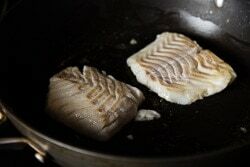 (Optional) If you are using a skin-on fillet, flip the fish (see footnote 3). Turn off heat. Carefully brush the miso sauce onto the fish. Add diced tomato on top. Transfer the skillet to the oven and bake at 356 F (180 C) for 5 minutes. Serve warm as main with green salad, brown rice, or bread. The sauce will be enough to cook 4 to 6 fish fillets, depending on the size of the fillets. I usually make the same amount, even if I’m cooking for two, and save the leftover sauce. Blend it with olive oil and some water to dilute it; you can use this as salad dressing or bread dip. The seeds will make the dish watery after baking. If you’re serving the fish with a salad, add these seeds to the salad if you don’t want to waste them. The hot skillet will continue to cook the skin while in the oven, so you will get super crispy skin! This looks really delicious and simple enough for a yummy weeknight dinner. I’ve got to try this once I have some red miso paste! This is definitely a super easy dish! You can use the sauce everywhere. We use it as a bread dipping sauce and love it so much! I enjoy simple dinners like this one! Love Sizzlefish, their fish is great quality! Pinned! 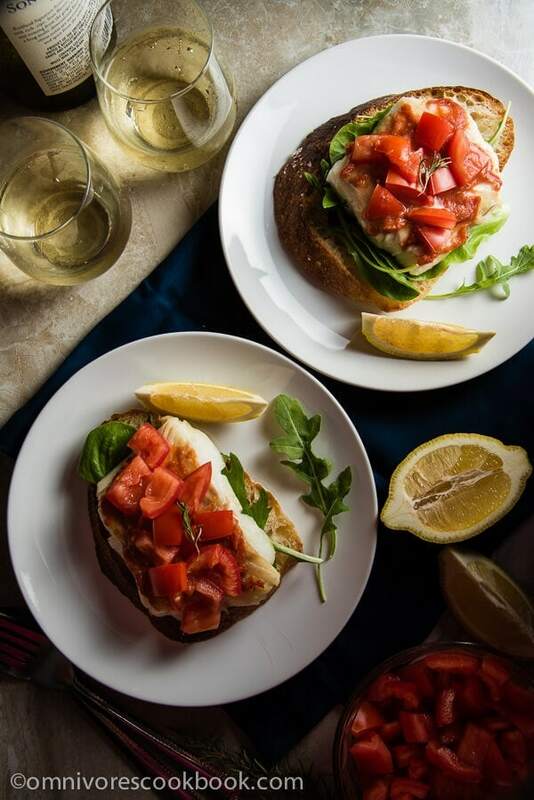 Simple and delicious and loving those moody dark background and bright food photos!!! Delicious little quick meal for the honeymooners with a little wine!!! Sharing everywhere and pinned my friend! Fabulous! Your fish is so pretty! I’ve never combined miso and tomatoes – can’t wait to try it! What a nice presentation of the ingredients, and the fish sounds amazing! 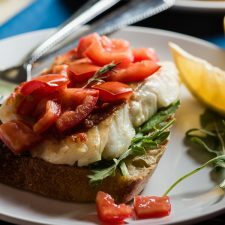 This looks so good – I’m always looking for tasty ways to cook fish 🙂 I can’t wait to try this! So healthy too! I’ve used miso in pestos before, but I haven’t thought of mixing miso and tomato to make it into a sauce! I bet it pairs very well with the fish! !